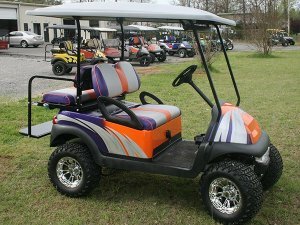 Cruise in style with this luxurious Lifted Golf Cart Club Car/Ezgo Precedents. This cart offers you a stylish comfortable ride around the golf course or the neighborhood. It's built to look like a rugged classic car. This high quality electric golf cart has so many great features, it's too hard to pass up.